A newborn is the best thing that can ever happen to parents. It’s a whole new life ahead and the first step into its calls for celebration. 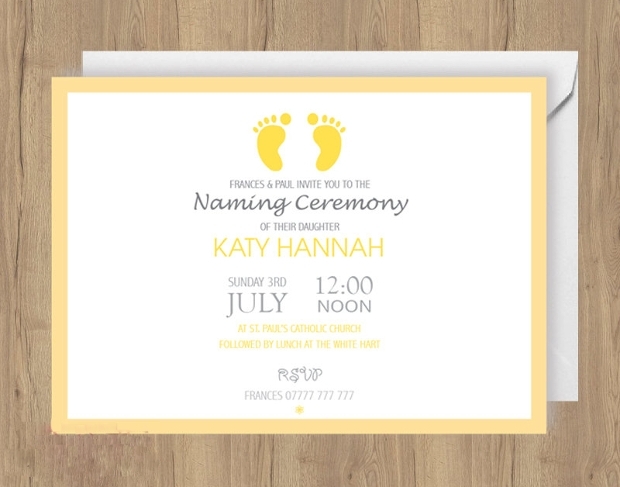 The christening of a baby is an opportunity to make your offspring known to the rest of the world and calls for a get together with family, friends and all known acquaintances. 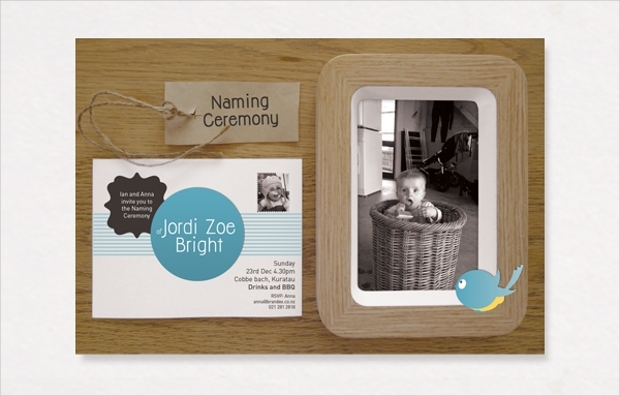 Here, we take care of choosing the best naming ceremony invitation card designs. 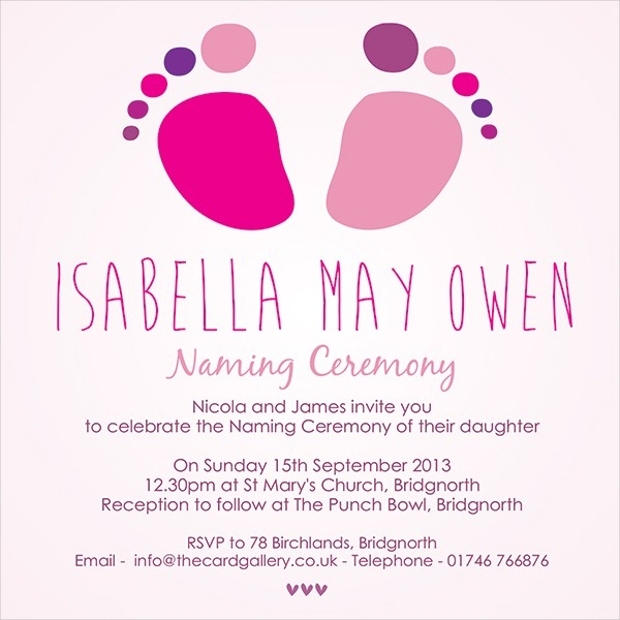 Boy or girl, the naming ceremony for your newborn child is always an event to celebrate and catch in the good memories forever. 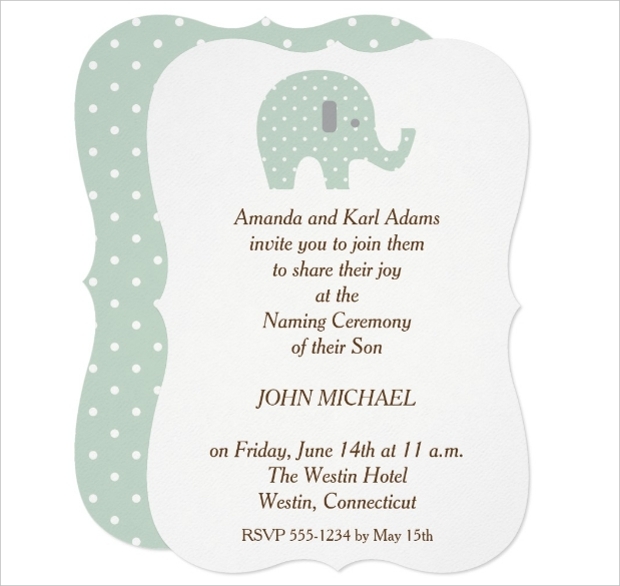 Here’s a simple and cute invitation that proudly proclaims the first event you would ever host in the name of your son. 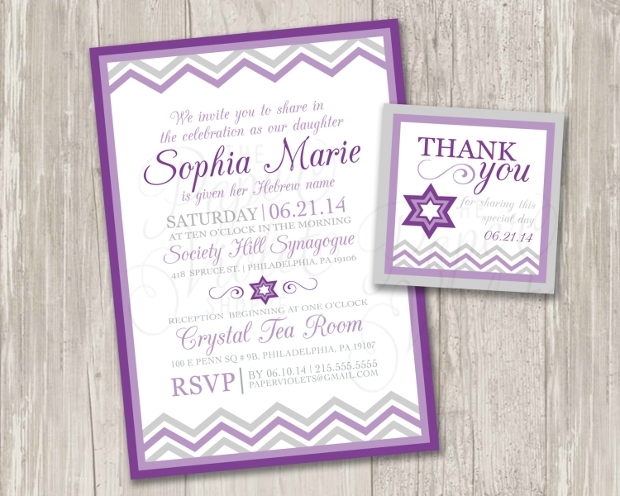 Completely customizable, you will just need to fill in the relevant details. 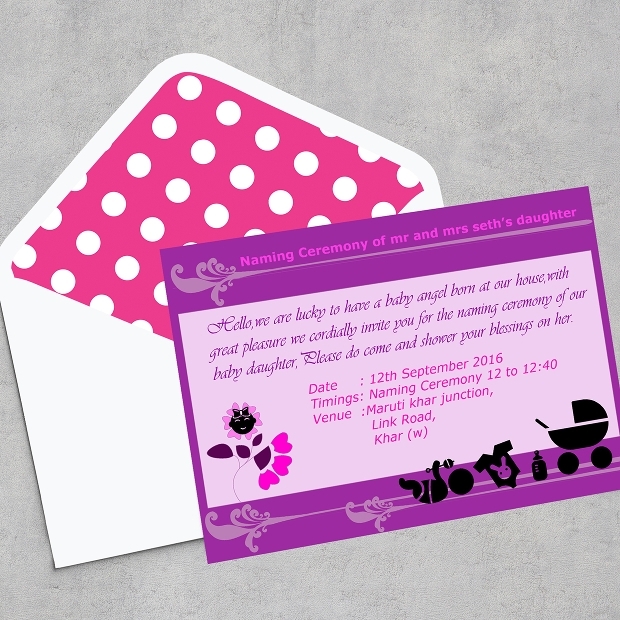 Cute and adorable, this naming ceremony invitation design is just perfect for the event. 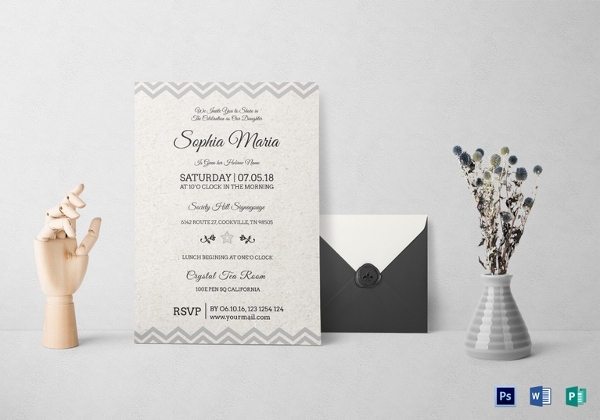 Apart from enough space for necessary details like venue, timing and a personal message, it’s the design, color combination and clipart that make the difference here. 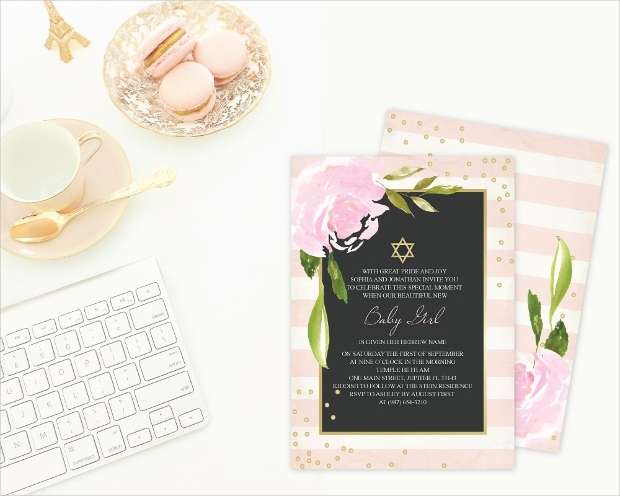 A highly personalized and sophisticated design for a naming ceremony invitation card, this would be perfect if you are hosting a more high end party rather than inviting a few close friends and relatives. 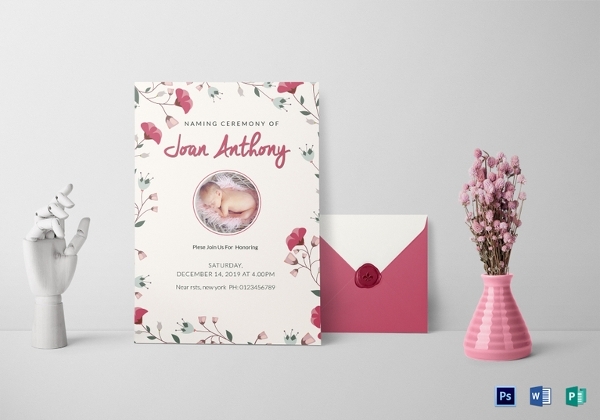 The invitation card has space for putting in the location, the time, the reception venue, the date, contact information, RSVP date and of course the name of your baby. 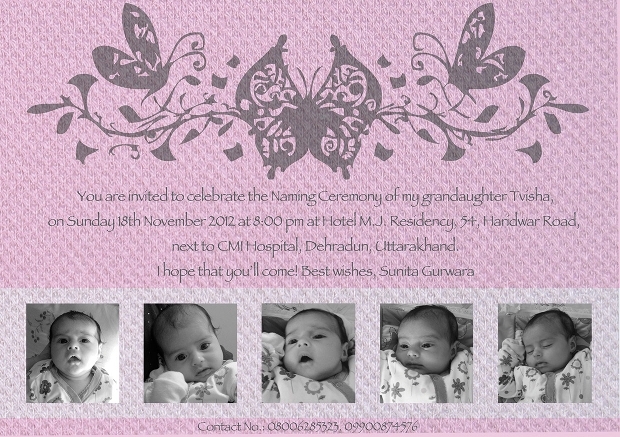 Now, this is a unique design for a naming ceremony invitation card. 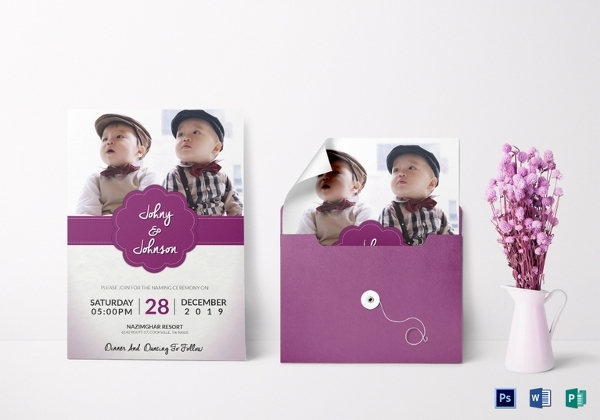 With only a single face, the best thing about this card is the integration of space for the first photos of the baby. 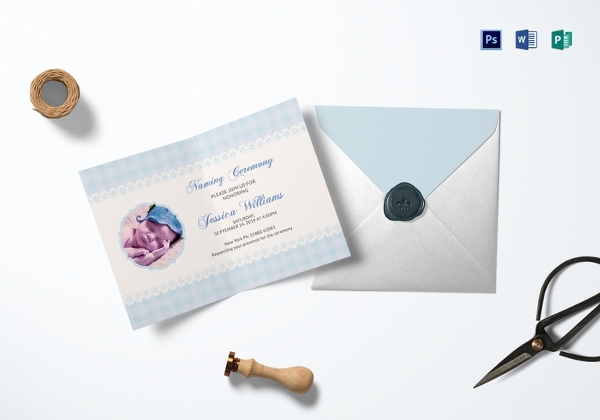 If that doesn’t make the design adorable, the graphics will. 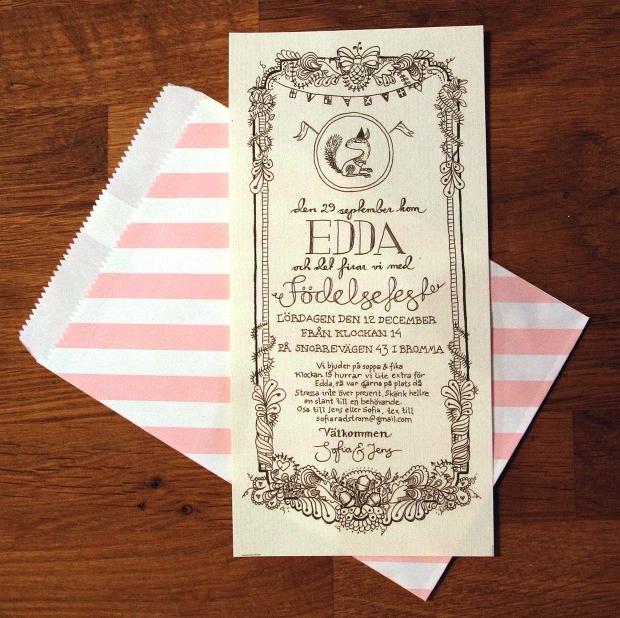 Do print it in a high quality handmade paper for the best results! 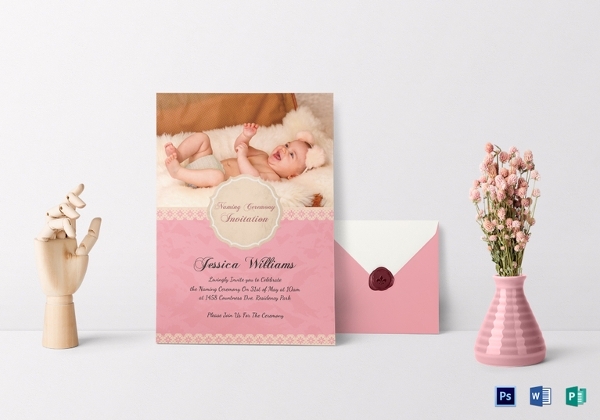 A simple but highly elegant card design for naming ceremony invites, this would proudly proclaim your addition to the family. 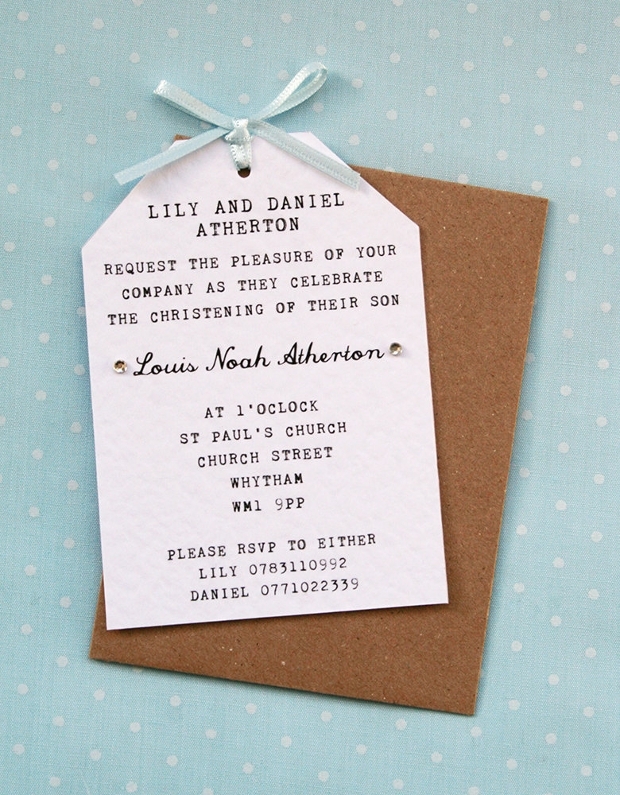 For best results, you need to print this onto a 300 GSM paper for the hammered effect. 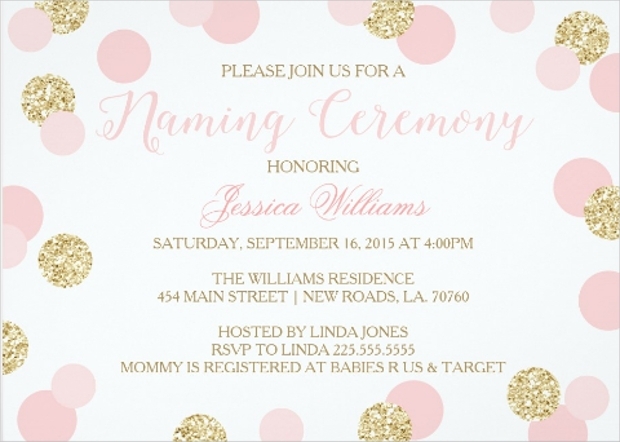 Hosting a party in honor of the naming of your child? 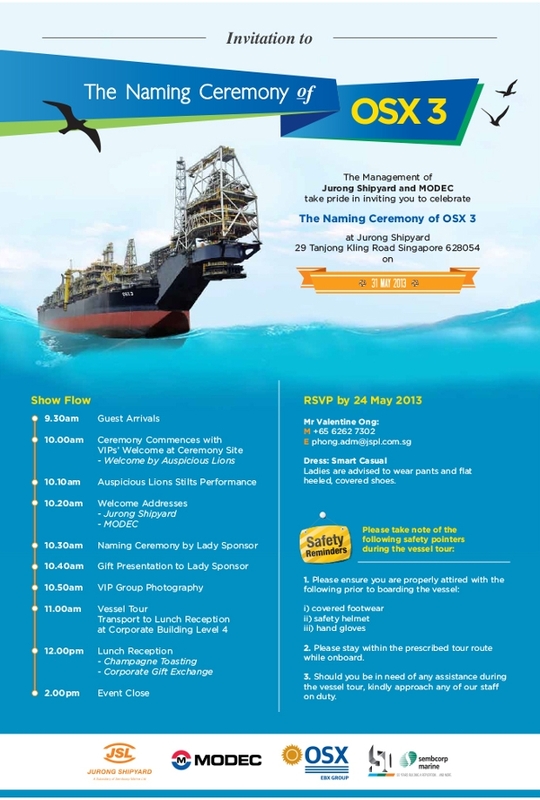 Well, the event surely calls for some extravagance. 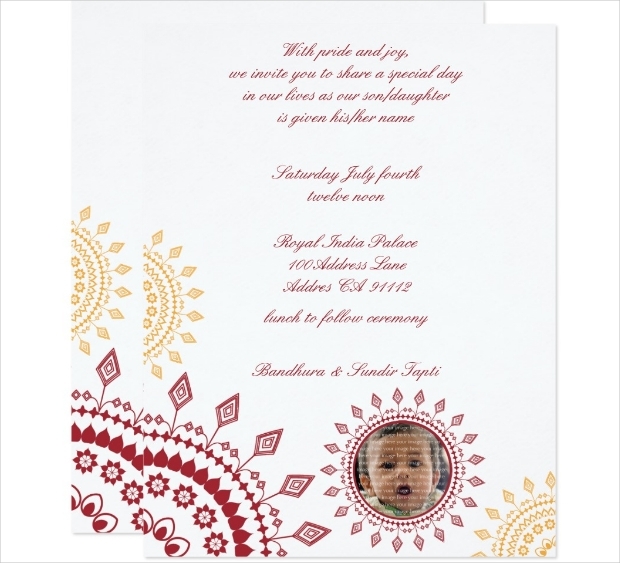 This beautiful handcrafted design should surely impress the invitees and make the day fun and successful. 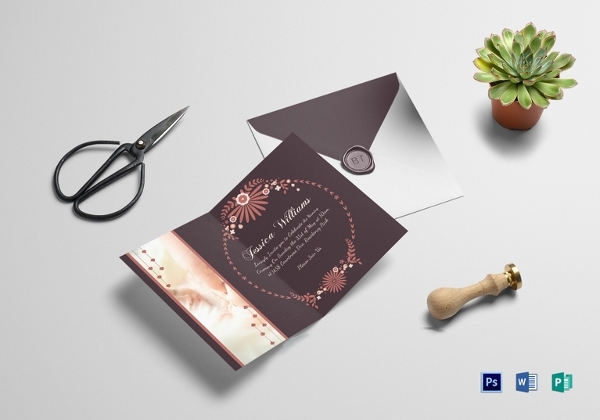 A perfect design for a special event – this card integrates silver and gold shimmers for an incredible surprise. 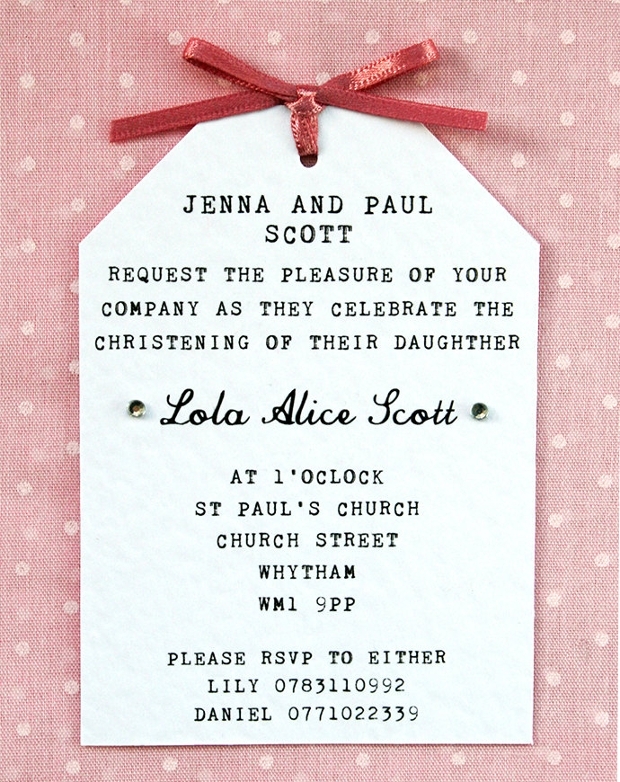 Put in simple but elegant fonts, the overall design is just enough to make a pleasing impression for the invitee. The message says the rest! 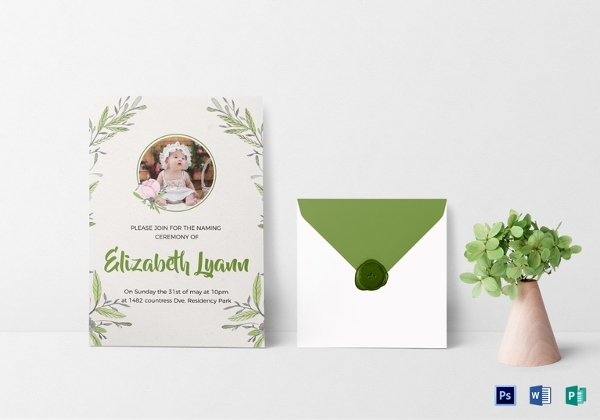 A highly customizable invitation card for naming ceremonies and christenings, this design offers a simple but elegant visual. This is just about perfect for the first event you would host in the name of your kid. 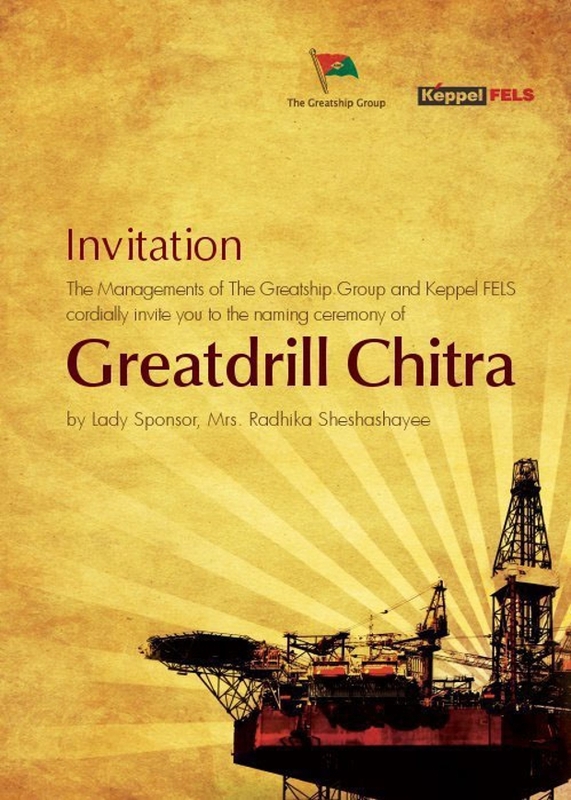 A professional looking event invitation, this can be put to use if your guests comprise of office colleagues and other formal acquaintances. 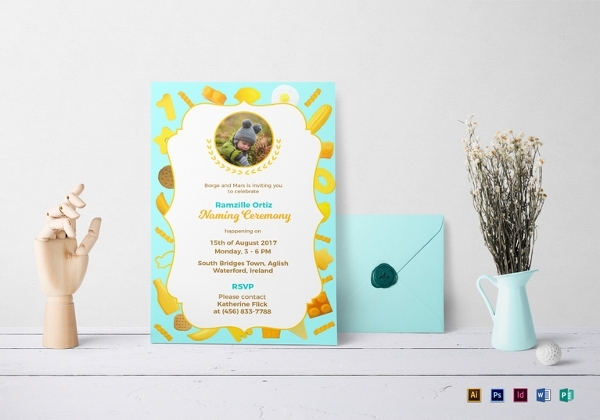 The design is multipurpose and can be used as a naming ceremony invitation, anniversary invitation or a corporate event/meet. 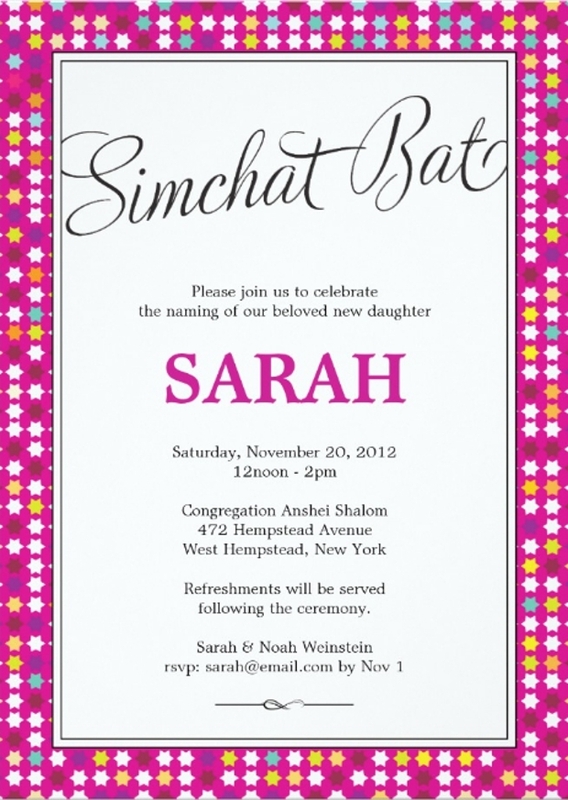 We take this opportunity to congratulate you on your parenthood and hope that these invitation designs meet your purpose.